I’m attending Conpulsion at Edinburgh University’s Teivot Student Union over the Easter Weekend. I’ll be running some Crypts and Things/OpenQuest and if the organisers can fit into their scedule doing a talk about Crypts & Things. If you are going hope to see you there. Also if you fancy running either a game of C&T or OQ for me, I can supply scenarios + characters, drop me a line on newt@d101games.com. More about the con here. In answer to Mick Red’s question ( Adventures for the OSR ) over at UKroleplayers.com. The Cursed Chateau(Rogue Games )by James Maliszewski. A big old haunted house scenario, oozing with atmosphere, marvellously presented and explained. The Grinding Gear (Lamentations of the Flame Princess) by James Raggi. Yes it’s a Death Trap dungeon, but its small and logical and very very well designed and written. The Nameless City( Mythmere Games ). Inspired by an HP Lovecraft short story of the same name, a small city of the Serpent People dripping with S&S goodness. Weird New World( Lamentations of the Flame Princess ) by James Raggi. Imagine the American North East as a vast unexplored fantasy wilderness. Put your characters in a boat and hit go. From the good old days….. The Gauntlet & The Sentinel (TSR ). The first part is truly creepy and full of nice twists. The principal of which carries through to the second part that really ramps up the Epic in a believable way. All that Glitters. (TSR ) One of my all time favourite adventure modules. The characters are going up the river following an old partial treasure map. At the end of their journey which takes them through an old magical tunnel that goes through the impassable mountains, through a post-apocalyptic desert leads them to a conclusion they will not be expecting. Worth noting that the authors of the above would go on to be part of the team that did the WHFRP 1st Ed Enemy within Campaign. Irillian from Best of White Dwarf Scenarios III . A city adventure in which the characters take part in an epic crusade against evil. There’s a great twist in the underlying premise that stops it being cliché and predictable. While the party is hunting down the source of the ills that inflict the city they get a guided tour of the city itself, which has seen much better days (think Italian Renaissance city, much down on its luck and gone to seed). And as an out of the box setting, that would work with all the above scenarios, I can not recommend enough ‘Pelinore’ which was Imagine magazine’s D&D campaign setting, which carried on into Games Master Magazine. Would you go to a UK Old School Con? Ok seriously considering this one for 2013. 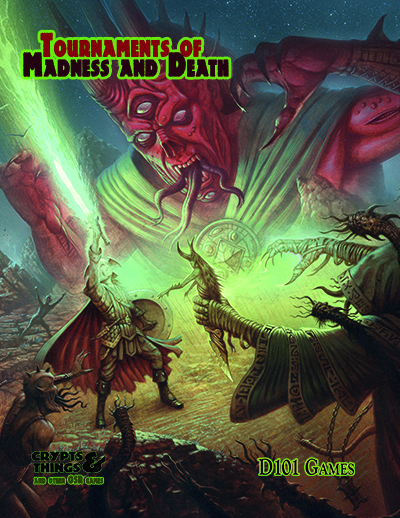 D101 Games has a bit of a split personality, in that we have our OSR games ( OpenQuest and Crypts & Things ) and then our Storytelling/indie games ( Monkey, WordPress and our HeroQuest supplements ). This means that its always abit fun and games when I go to conventions. Which side of D101 should I show off the most? Well the answer depends on the focus of the con. While most UK cons are a good mix of old and new, with indie games probably scoring a little bit higher because everyone wants to try new stuff out, unlike the storytelling/indie stuff there’s no dedicated con like Indie-con and Old School games while happening are sort of this novelty game in the corner type affair. In short I always feel a bit odd, that on one hand I meet some cracking players who I have a great game with but come away from the gaming table to the bar and wandering around and Old School gaming is a bit unloved. So I’d like to have a dedicated residential con for Old School Gaming. Game policy would be pretty draconian: Nothing after 1989 OR that doesn’t demonstrates a strong influence direct in its rules or game play, ie. a modern edition or a tribute game. 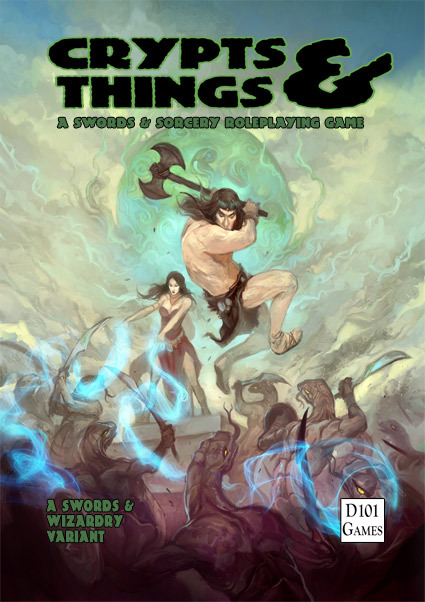 I would also want to encourage a wide selection of games, so its not just an OSR D&D con. Published before 1990: OD&D, D&D basic/expert/companion, AD&D 1st & 2nd ed, Traveller, RuneQuest II & III, Judge Dredd (GW), Warhammer Fantasy 1st Ed, DragonWarriors, Golden Heroes and of course Call of Cthulhu! Retro-clones/Tribute Games: Labyrinth Lord, OSRIC, Swords and Wizardry, OpenQuest, Crypts and Things. I do have a time and venue in mind, but I want to see if this one has legs before I risk the wrath of the short wee wifey. D101 would be doing the organising (so it would have “D101 Games presents”), but I would hope to have other Old School publishers involved. Drop me a line if you would be into helping with this at newt@d101games.com. Leave comments below if you have any ideas.